Happy Christmas 2013 from Snackistan! Just a quick post to wish you all a snack filled Happy munchy Christmas and a jolly New Year. Watch this space from January onwards for lots of new recipes, more of the book’s out-takes and bloopers, and plenty of Snackistani trivia. Image of the Al Hariri Mosque in Beirut as captured by robertinbeirut, borrowed under the Flickr Commercial Commons Licence. 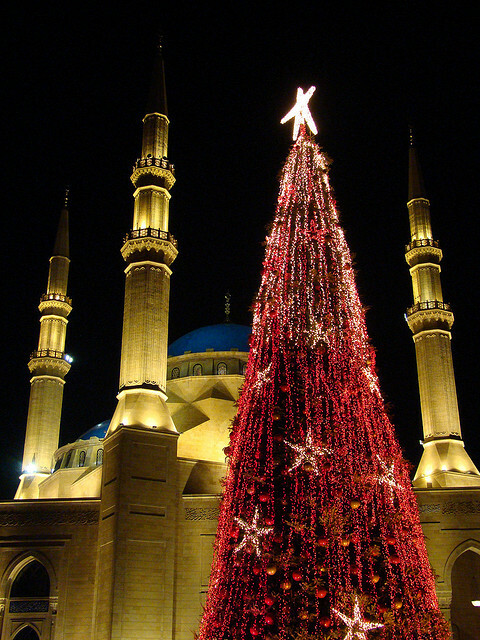 This entry was posted in Postcards from Snackistan and tagged Beirut, Christmas on December 24, 2013 by Sally Butcher. It’s me! RobertinBeirut, (only I’m not in Beirut any more). (where I now live) Cool! “Turcos” which was very derogatory when they arrived (from the Ottoman Empire around the 1900’s). They were mostly Syrians, Lebanese, &Palestinians escaping the last days of the Ottomans. Anyway, I love the recipes, and will be cooking some up soon!